SpeakEasy Stage Company presents a moving and thoroughly enjoyable, even grandiose but always heartfelt, production of The Color Purple. Based on the novel by Alice Walker and the hit movie, the musical is an immersive tale of Celie, an “ugly” African-American woman who has enough heartache and troubles for us all, as she journeys from a young girl who is raped by her father to a mature woman who finds love and comfort in her family and friends, and, moreover, herself. SpeakEasy really out-does itself at the hands of masterful director Paul Daigneault (2013 My Theatre Nominee for In the Heights). Daigneault assembles a truly stunning ensemble who delivers the voice and heart to this soulful production. This may be one of the “the” shows to see for the season. To begin, I missed the opening number, listening at the house doors as the company opens the story with a taste of their sweeping vocals. Led by Music Director Nicholas James Connell, the cast produces a warm blend of voices that, one minute, wash over you like a soothing warm breeze, and, another minute, soar to your ears like a bird in flight. The majestic score is not lost on these trained performers, matched by the excellent supporting live band. Daigneault is right to allow Connell to feature the music in impressive ways; the book is just subpar, despite being written by Marsha Norman, a Pulitzer Prize-winning playwright. Despite these limitations, Daigneault finds the heartfelt soul and rhythm of this musical, drawing the right colors from his talented cast. Lead by Lovely Hoffman as Celie, the company is a huge ensemble of characters who made varying impressions on this reviewer. Overall, the men were considerably weaker than the women; perhaps this is a product of Norman’s writing, giving her male characters substantially less in story or characters, and the score does not provide nearly the same vocal range for these characters compared with their female counterparts. I found David Jiles, Jr.’s Pa and Grady to be mostly forgettable, and even Cliff Odle’s Ol’Mister fails to impress (though Ol’ Mister has an odd change of heart at the end that is perhaps an irreconcilable defect in Norman’s writing). I have not read Walker’s source material, but, after seeing SpeakEasy’s moving production, you bet that I plan to read it soon. Hoffman emerges as a performer in the heavy and incredibly difficult role of Celie. I felt something off about her Act I performance, but, given her defiance and strength in Act II, I may have missed some of the subtle growth in her character, rather than any defect in her performance. One of my bigger critiques was her inability to connect with the audience on some of her songs. Her “I’m Here” is a slow build that manages to get to the heart of the song by the end. Hoffman truly connects in her dialogue, especially with her female co-stars. The shining stars, however, are the supporting female characters. Crystin Gilmore dominates her scenes with a mix of raw sexuality and softness that is truly dynamic and electric onstage. Gilmore has an “It” factor that I frequently remark is the making of a star. Her “Push Da Button” is exciting, while her “Too Beautiful for Words” and “The Color Purple” are touching and warming. Her strength as a performer and character infuse the production with the perfect amounts of confidence and poise that showcase some of the play’s themes of conviction, strength, and feminism. In short, she is just too beautiful for words, as a character and as a performer; you couldn’t blame Celie for falling in love with her. Complementing this performance was the dynamic Valerie Houston as Sofia, who shakes things up with her “Hell No!” and her wonderful duet with the charming Jared Dixon’s Harpo in “Is There Anything I Can Do for You?” Houston explores the range of Sofia’s emotions, infusing her character with a rich tapestry of emotions and characteristics. One of the shining stars is Aubin Wise’s rarely-utilized but always stunning Nettie. Wise’s grace and natural presence onstage is not to be forgotten, easily creating the unforgettable Nettie; again, you understand as an audience member why Celie cannot forget her big sister. I hope to see Wise tackle a role with more substantial stage-time in the future. Equally unforgettable is the strong female ensemble, especially the Church Ladies, who blend beautifully to shine in their “Big Dog/Our Prayer (Reprise)” and, especially, “Miss Celie’s Pants.” The latter number is a show-stopper for these dynamic women to feature soulful and joyful voices with some sass. Indeed, the sheer versatility of musical styles allows the ensemble to showcase their vocal and emotional range in this production. If you aren’t tearing-up in the cast’s finale of “The Color Purple (Reprise),” I may wonder whether you have love in your heart. The scenic design by Jenna McFarland Lord is some of the most innovative and spectacular that I have seen on a Boston stage. With a giant tree which proves incredibly functional at Daigneault’s clever direction, the stage reaches the four-corners of the globe by utilizing every last inch of this gorgeous set. 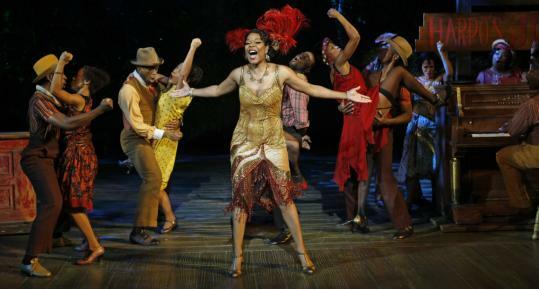 With subtle touches like tree roots and a steep incline for the African journey, the set tells the story of Celie’s journey with color stage pictures. Equally colorful (how appropriate) is Karen Perlow and Erik Fox’s lighting design. With a musical named “The Color Purple,” I would expect a dazzling array of light and color; I was not disappointed. Perlow and Fox’s co-design is warm, inviting, and beautifully illuminating to tell the story. The subtle background glow, the encompassing wash over the stage, and the inviting spotlight create the perfect blend to highlight the wonderful work of the cast. While I felt that Act I was sluggish in parts (partly due to Norman’s lackluster script which must span decades of Walker’s material to tell Celie’s journey), Act II was worth the price of admission, if not, “The Color Purple” and its reprise alone. I don’t think that I’ve ever said this in a review, but I would pay to re-see this production. I’m not sure if I’m saying that because I felt like I missed something in Act I or if Act II was that good. With a story and music that are rarely heard, The Color Purple is a welcome and heartfelt addition to our chilly Boston this season. SpeakEasy presents perhaps one of the best shows so far this season, while leaving two more productions left; they finish with The Whale by Samuel D. Hunter and the rarely-produced and always-exciting Carrie: The Musical , based on the popular novel by Stephen King.